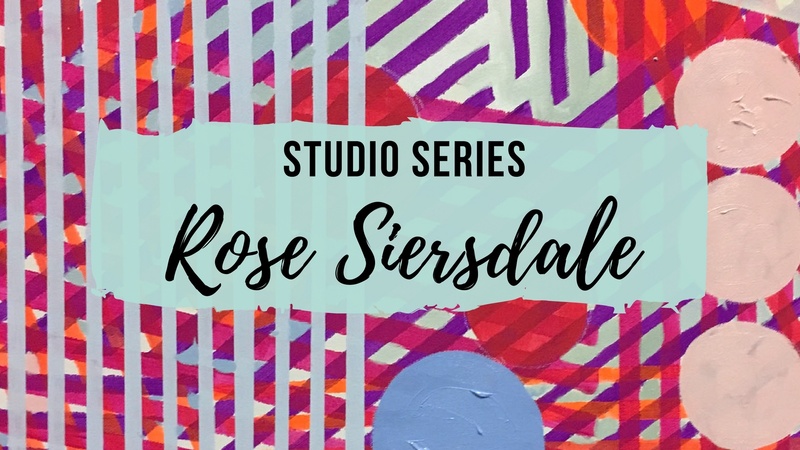 Rose Siersdale is a New York City-based artist who creates oil paintings with a specialized technique - she only uses professional grade archival materials. Her work is colorful and vibrant drawing inspiration from both contemporary art, Abstract Expressionism, and Minimalism. 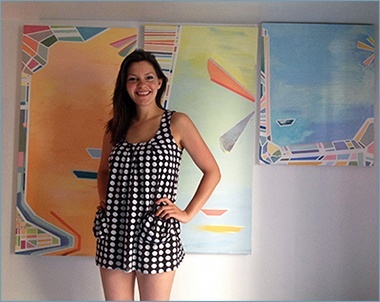 She is currently working with the ReMerge Artist studio in Brooklyn. Tell us a little about yourself and your art. I have been dedicated to my artistic practice since I can remember. I grew up in a home that celebrated the arts, which I feel really fortunate about. I’m formally trained in painting and know all of the “rules” to this practice. My professors taught me that if you want to break the rules, you have to know them first. A ton of realistic still lifes and figure drawings built the foundation for my abstract paintings. This method also creates space for a more original form of abstraction. I am playful in the way I work with the figure or blend the recognizable world with total abstraction. I used to joke with my friends about how it is important to give the viewer “something to hold onto” in the painting. 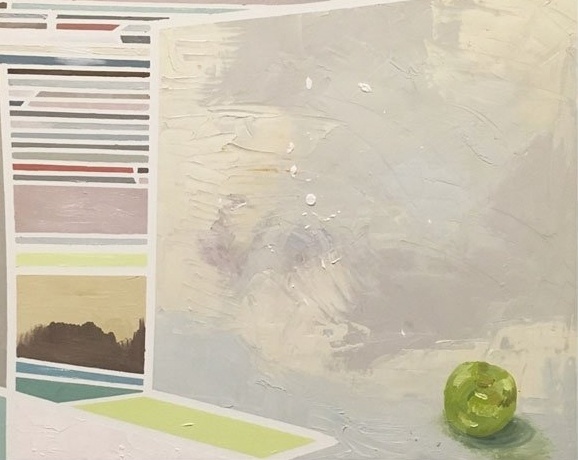 For example, I have this one piece called “The Distraction is the Subject” that is a field of abstraction with a small green apple in the corner. The apple helps to ground the painting and maybe make the viewer more comfortable as they travel through the rest of the work. Any recommendations for young or emerging artists? Picasso once said that you have to make 100 bad paintings before you can make one good one. It might sound harsh, but I found it incredibly liberating! Don’t be afraid of the process or the work it takes to create a strong body of art. If you wait until “inspiration hits,” you’ll never get anything done. Just make the work and leave judgement behind. The best is yet to come, right? I am absolutely still a student of the arts. I look back through art history and theory for fun, which might sound weird. I also stay submerged in the contemporary art world in NYC. This past fall, I worked for a contemporary art auction house in the heart of Manhattan and it was the most fun I’ve ever had! The work being made today is SO exciting and is rocking the art world. We’re seeing a wave of new identities being allowed into the sphere of influence that weren’t there before. I am looking to be a part of that larger conversation. Specifically in relation to my practice, I am most interested in the Abstract Expressionists (Mark Rothko, Helen Frankenthaler, Barnett Newman, etc. ), and the Minimalists (Frank Stella, Agnes Martin) from art history. I can’t get enough of George Condo, who I believe will influence contemporary painting in the same way Picasso did for his time. I also love Kristen Baker, Charlene Von Heyl, Devon Shimoyama, Mickalene Thomas and Amy Sherald. It’s hard to choose! Since I could hold a paintbrush. I remember at age 4 I was adamant that every piece I created be framed and hung ... I was very proud. I started formally taking art classes at the age of 12 and kept studying through to my BFA. Is being an artist your full time profession or an all consuming side passion? I do have a part-time gig in interior design, but I’m a full-time painter, heart and soul. 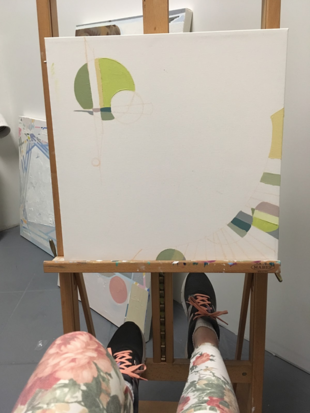 At an artist studio space in Brooklyn, NY. There are 40 other incredible and supportive artists in my building working across disciplines - it’s very inspiring! I can’t wait until my work starts to show overseas! 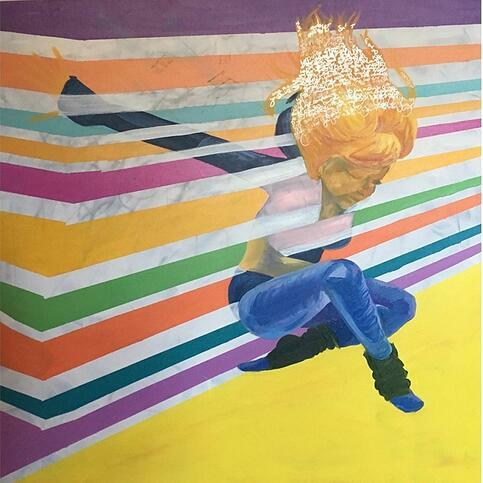 Check out Rose's work on Indiewalls and follow her on Instagram. Interested in receiving Studio Series updates direct to your inbox? Join our mailing list!